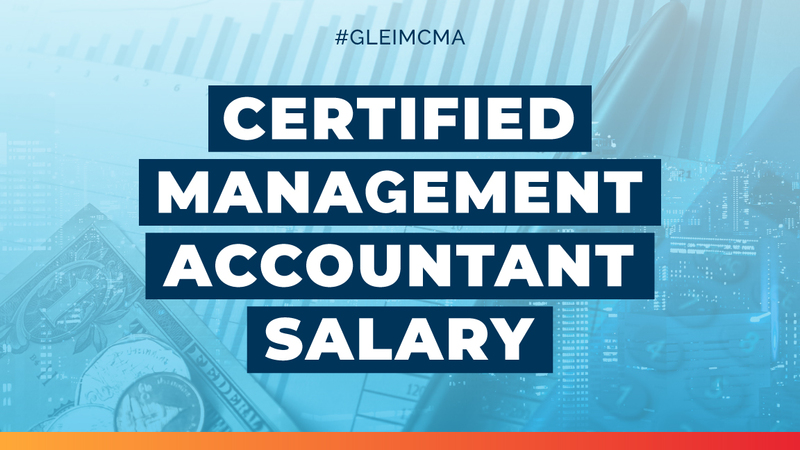 According to the 2018 survey report, the global average salary for a CMA was $81,000. If you include bonuses and other compensation, that number rises to $92,000. Total compensation for CMAs is 67% higher than non-CMAs. The gap between CMA and non-CMA salaries is widening. Last year, CMAs only earned 50% more in total compensation. The author of the survey report, Shannon Charles, Ph.D., commented that “Some of this increase could be partly attributable to a shift in the percentage of CMAs across regions.” There has been a slight increase in the number of CMAs in the Americas and a decrease in Europe and Asia, meaning there is a greater concentration of CMAs in the region of the globe where CMAs are paid the most. Don’t extrapolate too much with this information though, because it’s only a trend of the past year. The 2016 report noted the opposite, that the mix of respondents moved from being U.S.-centric to increasingly global. Let’s break down the IMA’s report by region. The median base salary for a CMA in the Americas is $110,000, and median total compensation is $125,000. For non-CMAs, those amounts are $83,800 and $92,000 respectively. 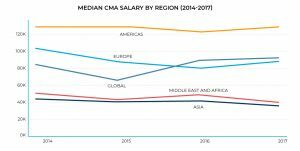 CMAs make an average of 36% more in total compensation, which may seem small compared to the global average increase of 67%, but that’s because the base salaries in the Americas are already so high. Average CMA and non-CMA salaries in the Americas are the highest anywhere. When you compare this year’s CMA salary numbers to last year’s, you see that base salary increased 3.5% and total compensation increased by 1.6%. In the Americas, the difference between CMA and non-CMA average total compensation increased from 23% to 36%, a jump of 13 percentage points. Across Asia, CMAs make an average base salary of $30,000, and $34,000 in average total compensation. This is about 50% more than the salary of non-CMA accountants in Asia, which is $20,000 base and $23,000 in total. In Asia, the average base salary for a CMA decreased 14.3% from last year’s survey. Total compensation fell by 15%. But the salary and compensation of non-CMA accountants fell by much more: nearly 25%. So, salaries fell for all accountants in Asia but less severely for CMAs, meaning the gap between CMA compensation and non-CMA compensation widened. Despite the rough year, the CMA remains a good investment for the future. The report notes that there was an increase in the number of young respondents (20-29 years old), who normally occupy the lower-paying positions. This could account for the salary decrease. European CMAs make an average base salary of $85,000. Average total compensation is $88,620. They make about 50% more than their non-CMA peers, who have a base salary of $56,500 and total compensation at $57,500. In the past year, compensation has gone up for CMAs and down for non-CMAs. Getting certified used to only make a marginal difference (10% in past surveys) in Europe, but now that difference (50% currently) is much more substantial. The median base salary for CMAs in the Middle East and Africa is $35,000, and increases to $39,500 when you add in other forms of compensation. This is the region where the CMA certification makes the most difference: it more than doubles the average total compensation of non-CMA accountants. Non-CMAs in the Middle East and Africa have a base salary of $17,700 and total compensation averaging out at $18,500. Average salaries fell for everyone in the Middle East and Africa this year. CMA compensation went down 16.6%, and non-CMA compensation decreased 25.6%. While CMA compensation fell, it did so at a slower rate than non-CMA compensation. Total compensation for CMAs has fluctuated over the past few years. Globally, 2017 continued to see the rise in compensation that began in 2015. Europe saw a rise in compensation this year after a couple years of decline. The Americas and Asia have experienced relatively little change in compensation. The Middle East and Africa region saw a small decline. CMAs make more than non-CMAs. The IMA’s 2018 Global Salary Survey shows that, across the board, the gap in compensation is getting bigger every year. The CMA certification is more valuable than ever, and the sooner you decide to get it, the sooner you can begin earning more. Gleim set the bar nearly 40 years ago when Dr. Irvin N. Gleim created the first ever CMA review course. His goal? Help candidates succeed in their careers. Since then, more candidates have chosen Gleim CMA Review than any other review course. Find out more about the CMA exam and Gleim CMA Review by accessing our free CMA Exam Study Guide. The Certified Management Accountant salary can be yours. Gleim can help. The survey is voluntary and available only to members of the IMA (membership is required to maintain one’s CMA certification). All salary averages discussed in this article are calculated using the median. Amounts are adjusted to U.S. Dollars for comparison.